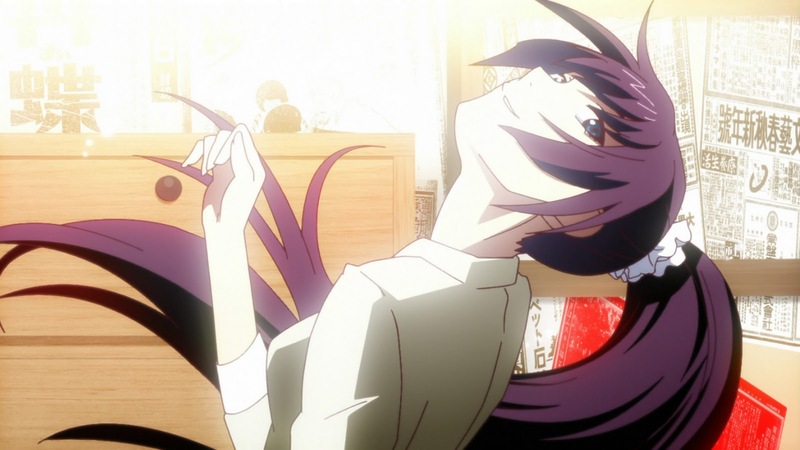 Shaft's style is most evident in Bakemonogatari, arguably the trademark of a Akiyuki Shinbo-produced title. 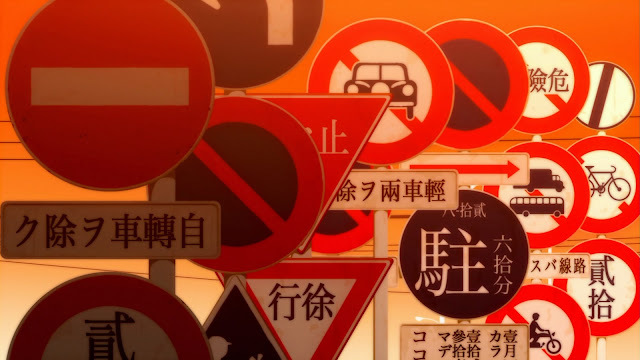 Here's a simple guide on what to look out for in any Shaft anime production. 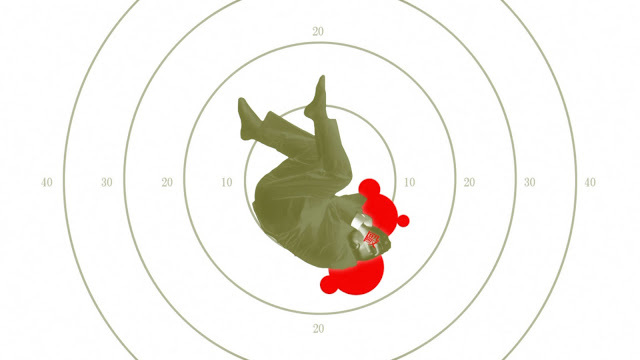 In any Shaft conversation, the first person who does this is in a position of power. It's pretty similar to the usual villian/hero-turning-his-head-to-stare-at-you-with-fiery-eyes, in that it gives off the I'm-not-even-going-to-bother-turning-around-to-talk-to-you vibe. This is often done with bright lights surround the head-tilter and a voice with a hint of arrogance or superiority. Senjougahara often does this because, well, she's an S.
Ominous factories lurking in the background, soaked in rays from the setting sun. 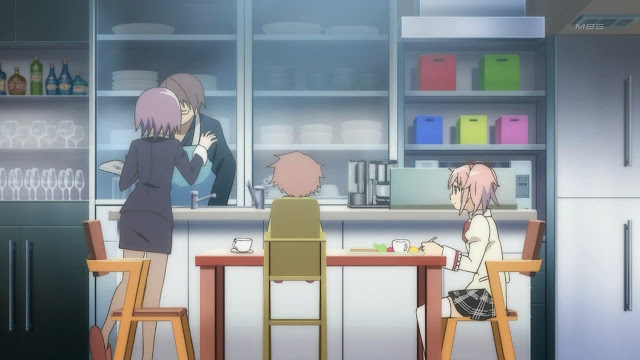 In the scene from Madoka Magica, Madoka feels afraid and is trying to ask Homura some questions regarding Mahou Shoujos. 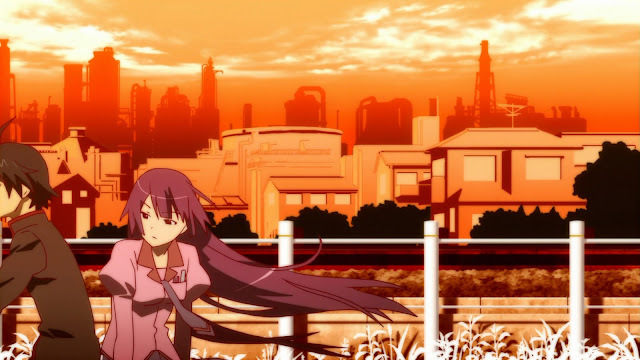 In the scene from Bakemonogatari, Senjougahara is heading towards the "home" of Oshino Meme, a weird occult-obsessed man that says he is going to help cure her illness. 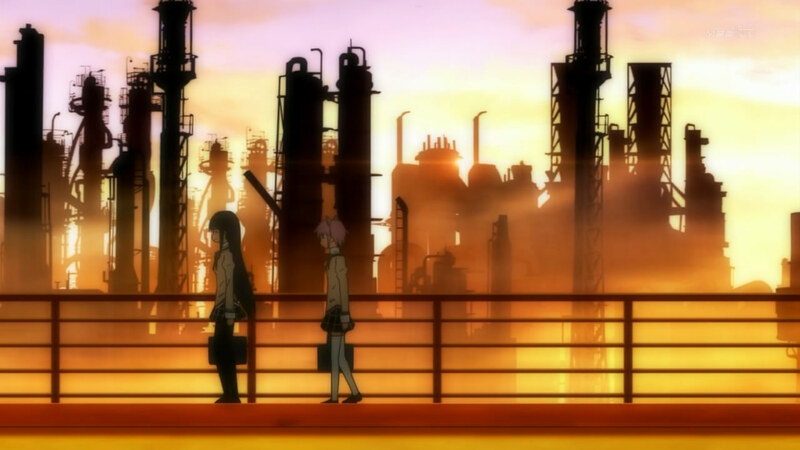 In both cases, the factories represent a mysterious greater power overwhelming Madoka and Senjougahara (though she doesn't look that way, her previous traumatic experience of nearly being raped by the head of a religious cult tells another story). 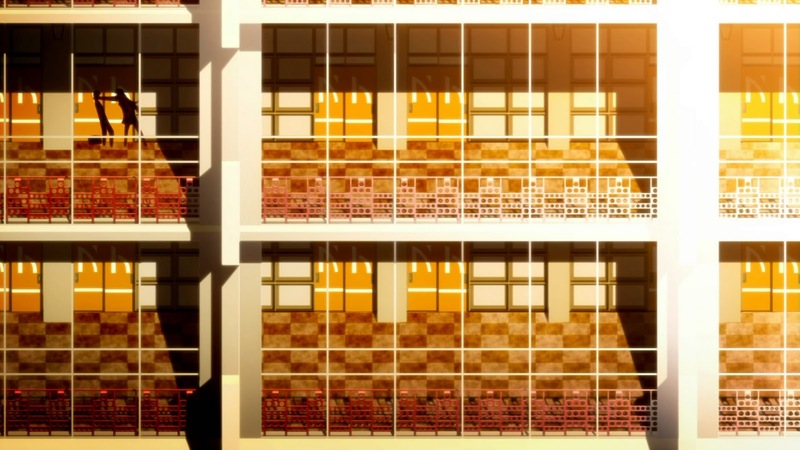 Buildings in Shaft anime also have lots of lines/beams and circles. They also tend to be really big and have wide open spaces. Senjougahara's house is small, rather empty, open, and kind of broken. 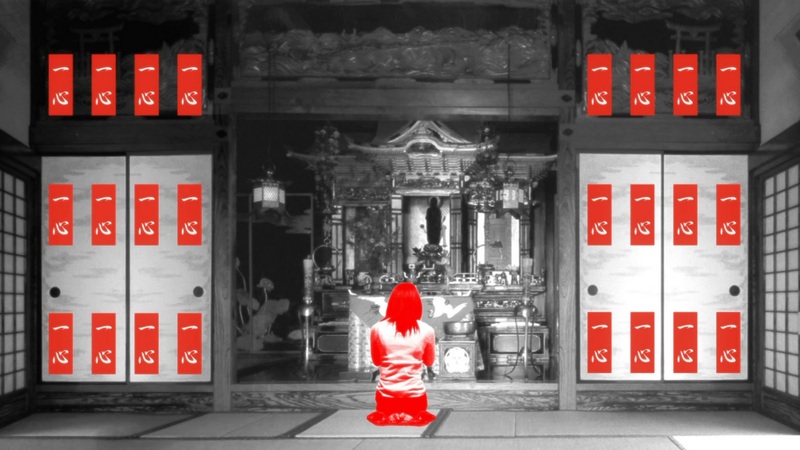 This reflects her broken family background and how she seems to be laid bare for everyone to see without a care in the world. 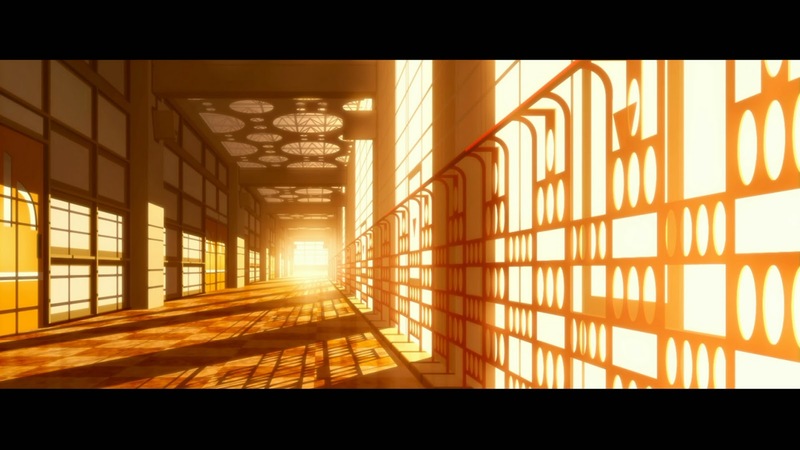 I'm not too sure how to describe the look of the architecture very well, but there's definitely a distinct design choice made by director Akiyuki Shinbo. Uniformity and coldness seems to be the theme here. Speaking of uniformity, Shaft has a penchant for numbering and organising things. 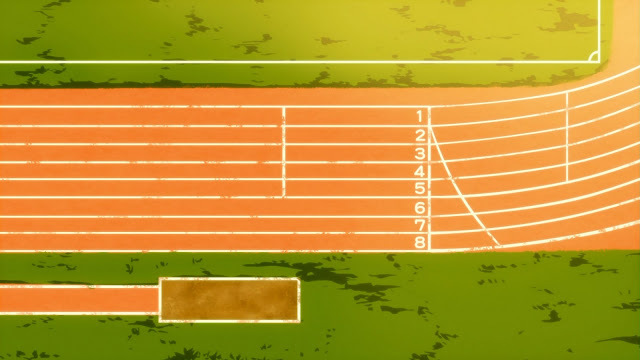 In the first episode of Bakemonogatari after the opening title credits, establishing shots of the school are shown, most of which contain numbers, such as the shot of the track above and the swimming pool lane numbers. 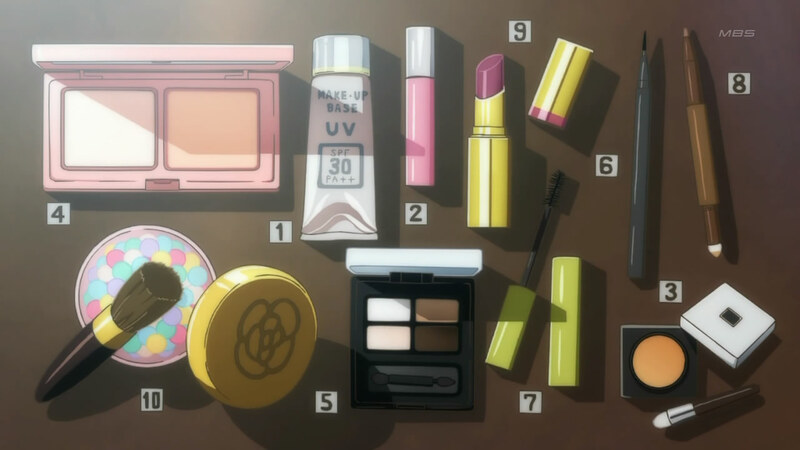 In Madoka Magica, Madoka's mum has a well-organised make-up kit. In a shot that was probably non-diegetic (since she took stuff out of a box and it wasn't laid on a table like that), the cosmetics are numbered according to what I assume is the order she puts them on. 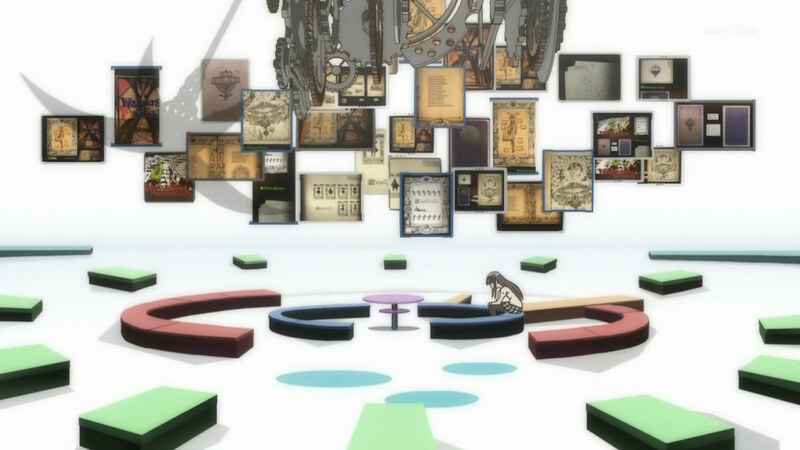 This level of OCD-ness is seen in some of the designs of Bakemonogatari, but is much more apparent in Madoka Magica. 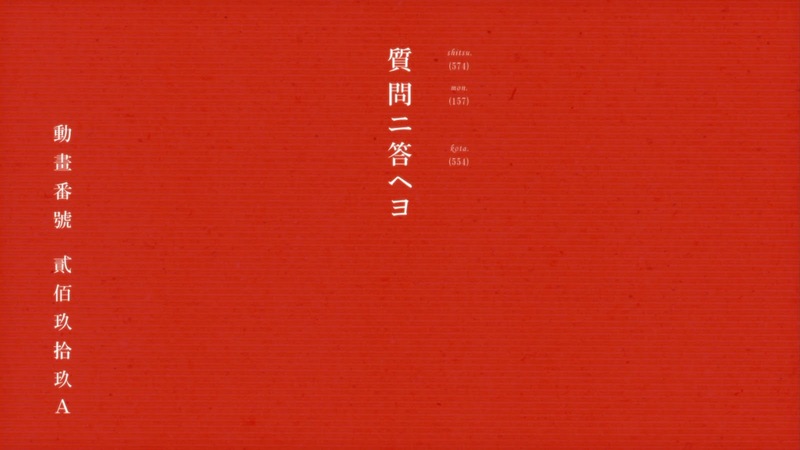 Using bright pastel colours for no apparent reason, another trademark of Shaft. Seriously though, the colours draw attention to stuff in the background that we would otherwise have missed out. 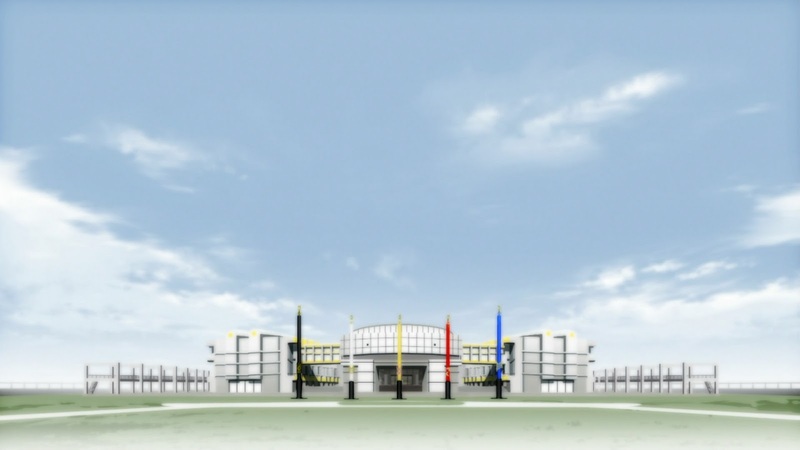 The school in Bakemonogatari looks more like a shrine or altar with those poles sticking out in front of it, alluding to the occult nature of the series. 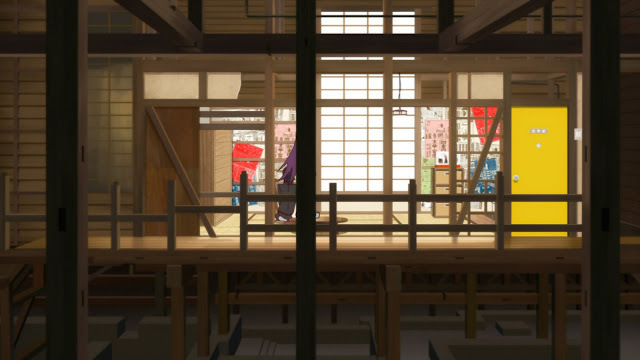 The coloured boxes in Madoka's house reflect the neat-freak nature of her mother. The colourful furniture in Homura's home serve to highlight how large and empty the place is, reflecting Homura's loneliness. 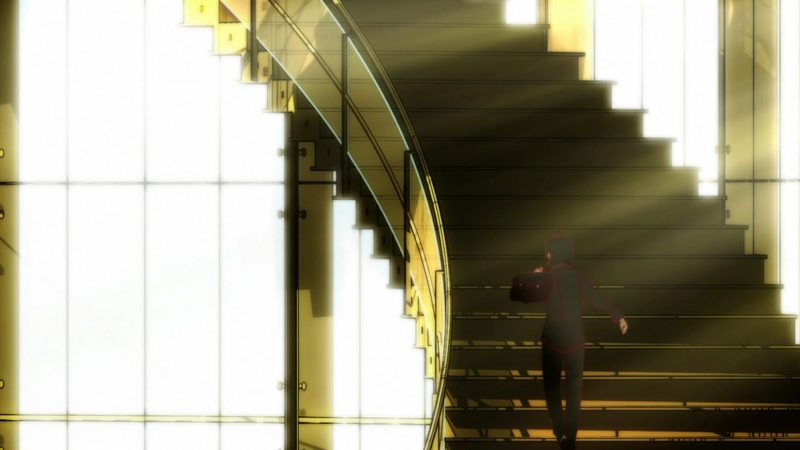 You'll realise that Shaft relies on text heavily to tell it's story. 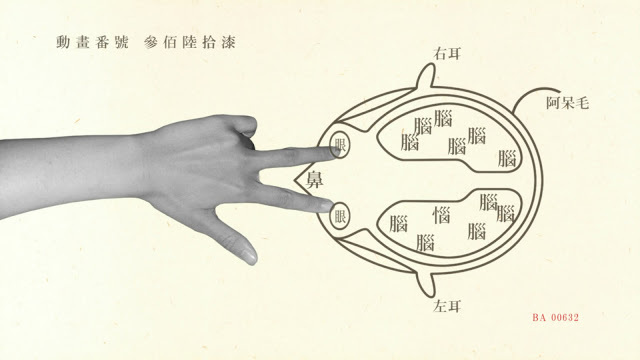 While some might argue this technique is overused and inappropriate for this medium, I think it was quite well done (with the exception of a certain TV episode). 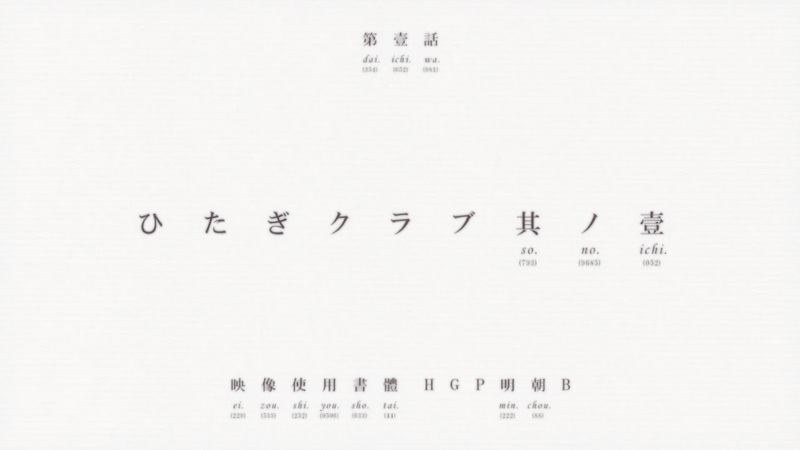 The fonts (HGB Mincho B) look good and they get to cut down on animation costs! This is, in my opinion, slightly better than static scenes where nothing happens. At least with this we still hear the characters talking and the on-screen text provides some additional information. Interestingly Akiyuki Shinbo has chosen to use obscure kanji as much as possible. 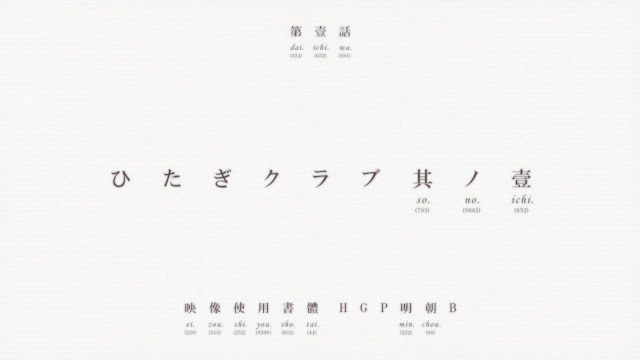 For example, sono (which roughly means "that") is usually written in hiragana (その), but they chose to use kanji and katakana instead (其ノ). 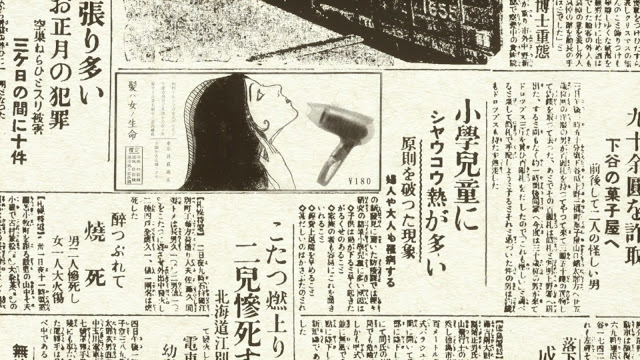 Also, sometimes even the numbers use obscure kanji, such as ichi (the number 1) written as 壱 or 壹 instead of 一. 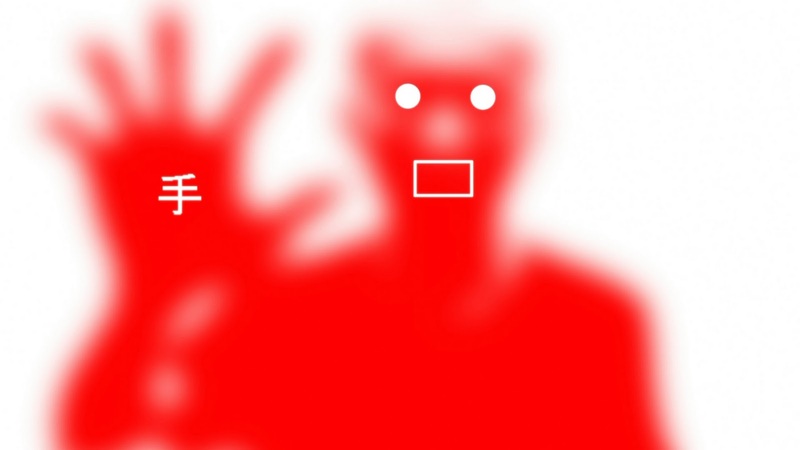 Some of these characters, like the 2nd form of ichi, are so obscure that even Microsoft's Japanese IME can't type it and Google Translate can't translate it. Blogger meronpan has a great post detailing some of the word choices in Bakemonogatari. 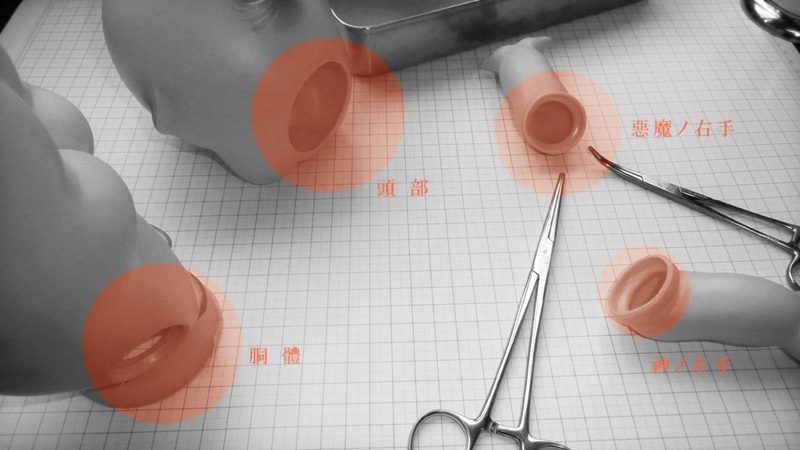 Though the old script-like medical drawings are much more abundant in Shaft's Sayonara Zetsubou Sensei, it also makes a few appearances in Bakemonogatari. The drawing style is similar to E-maki (絵巻), or literally "picture scroll", dating from 1130 A.D.. Again, like many things Shaft does, this is just a unique stylistic choice. 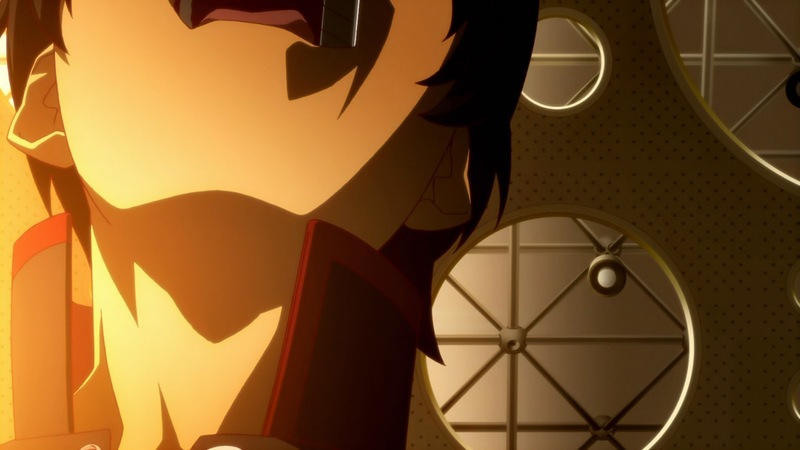 So those are just some of the visual tell-tale signs of a typical Shaft anime. More often than not, the design choices are just Shaft being Shaft, nothing too deep. But its these things take make it stand out from the rest and incredibly mesmerizing to watch. If you figured out all of these by yourself, then props to you! Your blog did a good job laying out a comprehensive guide to their unique style. In my opinion, the style is very boring for me and the dialogs are too long in the anime and most of them are just fillings. I don't really know how people love this series.